The Holiday’s are here and it’s time for beer! Put on those ugly sweaters, santa suits and onsies for a NEW bar crawl making it’s way through Philadelphia’s Midtown Village and Rittenhouse! 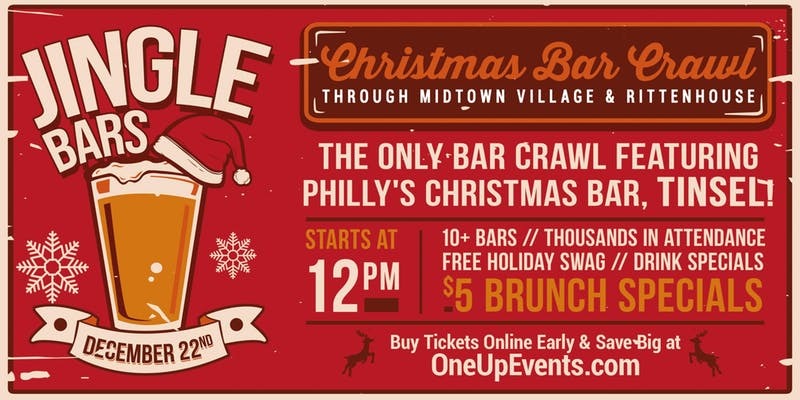 Join thousands of fellow crawlers as we celebrate the holidays in unison at 10+ great Philadelphia watering holes including the city’s ONLY Christmas themed bar. Tinsel! BUY TICKETS EARLY AS PRICES WILL GO UP AS WE GET CLOSER TO SELLING OUT! – Punch card with a price at the Stat’s Afterparty if you have 4 holes punched by visiting at least 4 bars. VISIT ALL BARS AND WIN A PRIZE! Check In starts at 12pm at the designated check in locations. You can check-in anytime between 12pm and 4pm. Bring an electronic or printed version of your ticket. Make sure you have your ID! This is a 21+ event. Once you check in you’ll be given a map of the other bars that are participating. You can head out to the other bars with your group of friends whenever you’d like and visit the bars in any order you’d like. Stay at each bar as long as you like! A: Check In starts at 12pm but you can show up at the checkin location whenever you like between 12pm and 4pm. The barcrawl drink specials end at 6pm. Q: What do I do after I check in? Q: Where are the check in locations? A: The check in locations are clearly marked on the locations page for your city. You MUST come to the check in location prior to heading out to the other bars. Disclaimer: Must be at least 21 years old to participate in this bar crawl; valid state ID or passport is required. Advertised drink specials, participating venues, and advertised times are subject to change and may vary. Oneupevents.com promotes safety and urges all participants to drink responsibly. If a venue is at capacity, we kindly ask that you either wait or proceed to another venue on the crawl. Participants must bring their print-at-home ticket or electronic ticket to the registration venue in order to retrieve the their wristband and map. If there are multiple check in locations, you only need to choose one (1). At each of the check in locations, our event staff will distribute the same Oneupevents.com wristband(s) and customized map(s) that will allow you to access the entire crawl and take advantage of the drink specials throughout the city. You will receive the exact same wristband and map at any of the check in locations. No refunds. All sales are final. Prices are subject to change while supplies last.